Beautiful all wood black cigar box, brass hinges with beveled edges all around in GOOD condition. Red and Gold label inside and out (click on picture to enlarger). 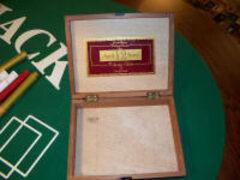 Writing on label from top to bottom is: Broadleaf Wrapper 1990 Aged 12 Years A Signature Collection by Rocky Patel. Very good looking and some day will be a collectors' item for sure. Size of box is 8 1/2" long, 6 1/2" wide, 2 inches high approx. 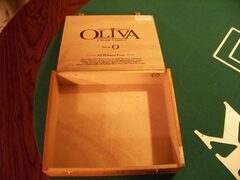 Rare Cigar Box is dark sherry wood hand made using dovetail, or groove and tong construction no nails or screws on corners. Top flips open from the middle. Unknown how old, but is not antique. 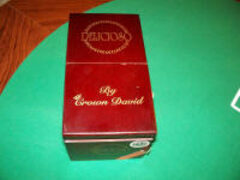 Wording on box is Delicioso By Crown David Delicioso Corona and on round white label Crown David Handmade on red label Sweet Cherry and on bottom 25 Delicioso Hand Made In Dom. Rep. Measures 4" high, 7" long, 4" wide aprox. 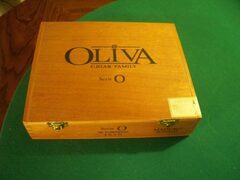 OSO1 Oliva Cigar Family Serie "O"
Wood Cigar Box Serie "O" 20 Torpedo 6 1/2 X 52 Maduro Broadleaf. Hand made in Esteli, Nicaragua. Box is tong and grove corners with 2 brass hinges and 2 brass snapping lockets on front. Very good Condition. Box measures 81/2" X 7" X 2" Tall. 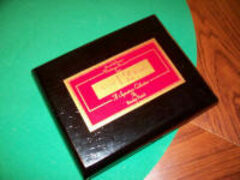 Very Good Condition - This is a Serie "R" La Gloria Cubana Calidad Suprema Cigar Box intials E.P.C. Hand made in Dominican Republic no nails used is tong and grove corners with sliding lid. Slides forward to open very nicely fitted lid box is wood dyed in black cherry. Measures 6" wide X 71/2" long X 41/4" high BIG BOX!